With equities seeing some rather significant gains into the close, the VIX cooled, settling -7.1% @ 17.23 (intra high 18.36). 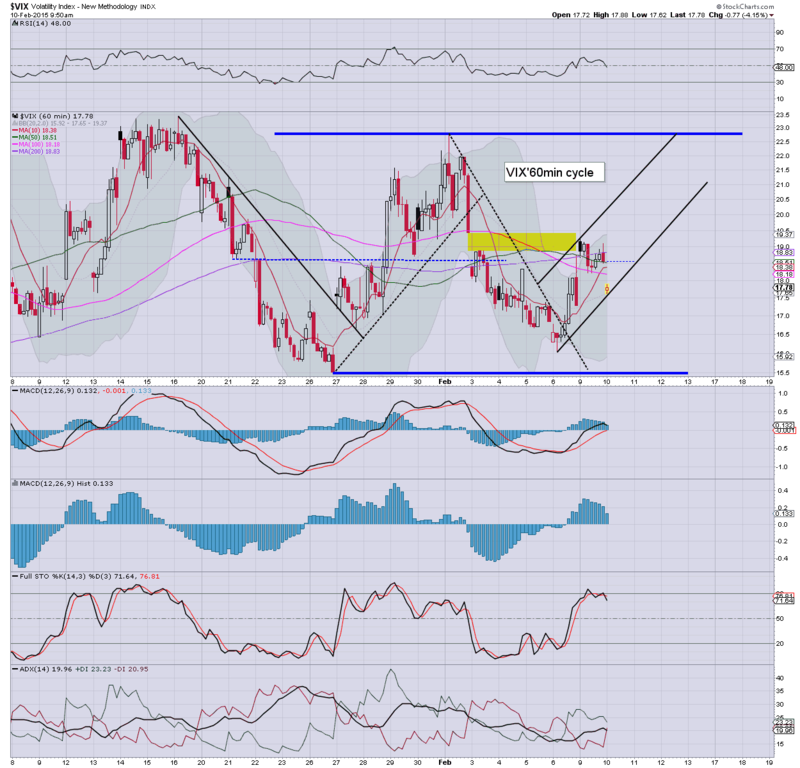 Near term outlook is highly uncertain with the ongoing 'Greek situation'. Weekly cycle is offering core support around 16. 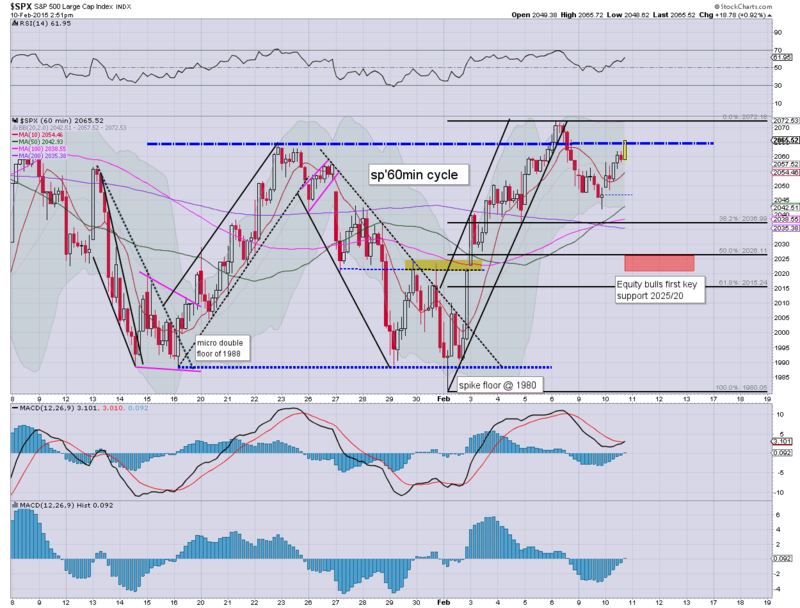 The bigger weekly cycle is offering the equity bears a hope that the past two months are a coiling phase. 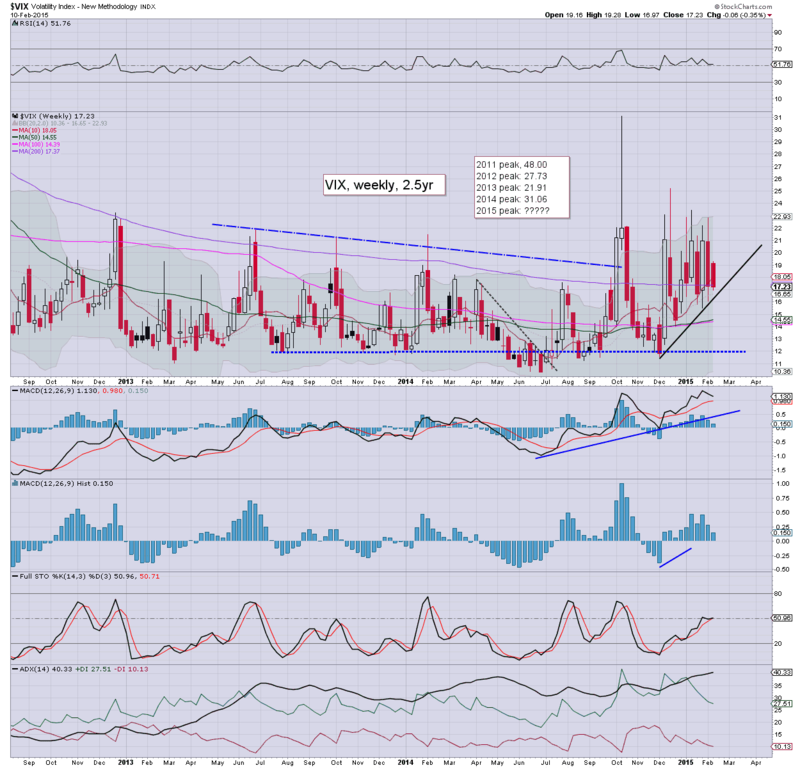 So long as VIX does not break under 16... there is a chance VIX is ready to jump back into the 20s. Upper weekly bol' is offering the 22/23s in the immediate term. Best guess... equities cool to the sp'2025/20 zone.. with VIX 20/22.. before the next real opportunity of new historic equity highs. US equities closed higher, having swung from an early low of sp'2048, settling +21pts @ 2068. The two leaders - Trans/R2K, settled higher by 0.8% and 0.6% respectively. Near term outlook remains... suspect... as the market will be highly vulnerable to snapping lower on any 'spooky' Greek news headlines. Without question... today was a bit of a mess. Opening gains.. but with clear reversals in the R2K and VIX at the open.. those held until late morning... but then the market just clawed its way higher. The fact we saw further strength into the close... truly bizarre... not least when you consider Oil was down by around -5%. The sp'2025/20 zone remains viable... but if market jumps above 2072 early tomorrow, it'd seem new historic highs are due in the current wave. 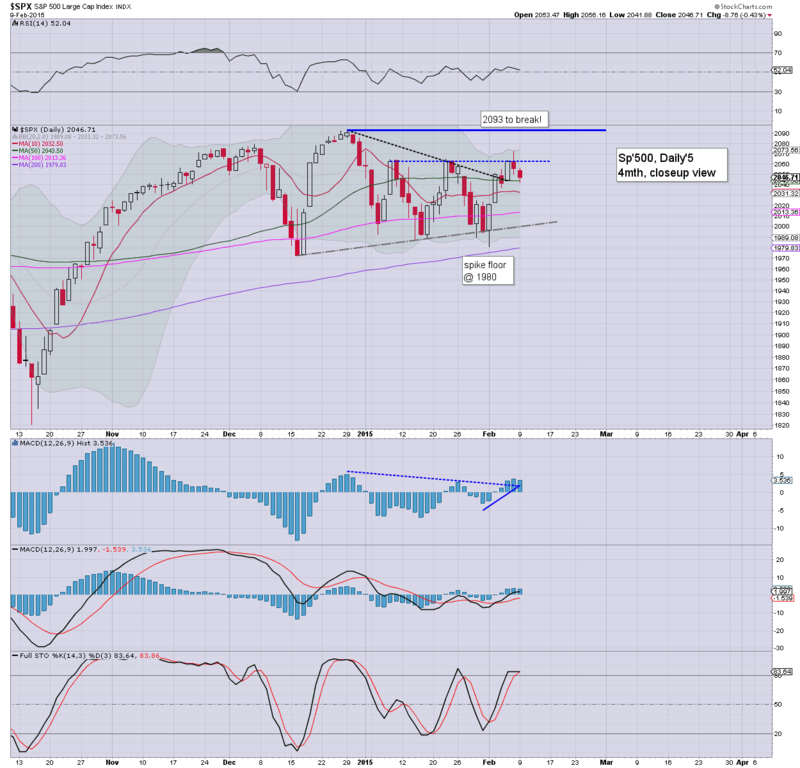 US equities see continued latter day strength... back above the old resistance of sp'2064. VIX is confirming the renewed market confidence, -6.6% in the 17.30s. Metals remain moderately weak, Gold -$6. Oil has lost the rather important $50 threshold, -5.0%. I'm surprised at the continued equity strength. No doubt, much of it is due to short-stops being hit, and bears covering at 'whatever price is necessary'. Regardless... best guess remains sp'2020s before a more sustainable chance for new historic highs. As ever.. market will be VERY vulnerable to any news headline in the closing hour. Notable weakness, TWTR -2.1%.... the CFO needs to learn about not clicking suspect links! Well.. 2.30pm is a typical turn time.. so.. lets see what the equity bears can manage into the close.. there is certainly plenty of time for ALL indexes to turn red.. even the sp'/dow. Best guess remains.. the sp'2025/20 zone.. with VIX 20/22. As ever.. market will be VERY vulnerable to any late day comments about Greece. 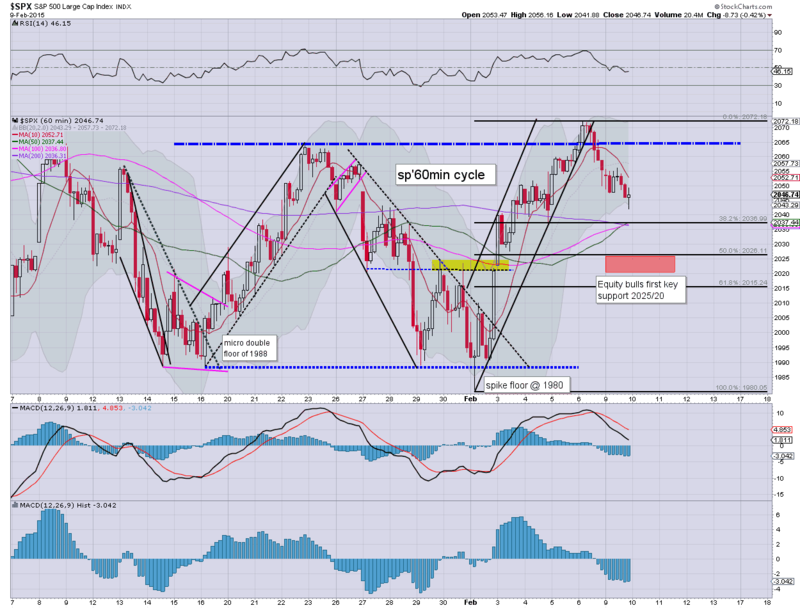 From a pure cyclical perspective.. bears should be able to knock this market lower into the close. *metals remain weak... along with Oil.... pressured by the USD which wants to claw to the giant DXY 100 level. After all.. would you rather hold Euros? 2.33pm.. Oil loses the $50 threshold... and it is rather incredible that the market breaks a marginal new high of sp'2062. Oh well.. it IS typical turn time... still time to close red. Notable weakness, copper miners, FCX/TCK, both -4% or so. 2.43pm... another wheel barrow of short-stops hit.... to sp'2065.... madness! Equities see another minor wave upward.. although the two leaders - Trans/R2K, remain notably weak. 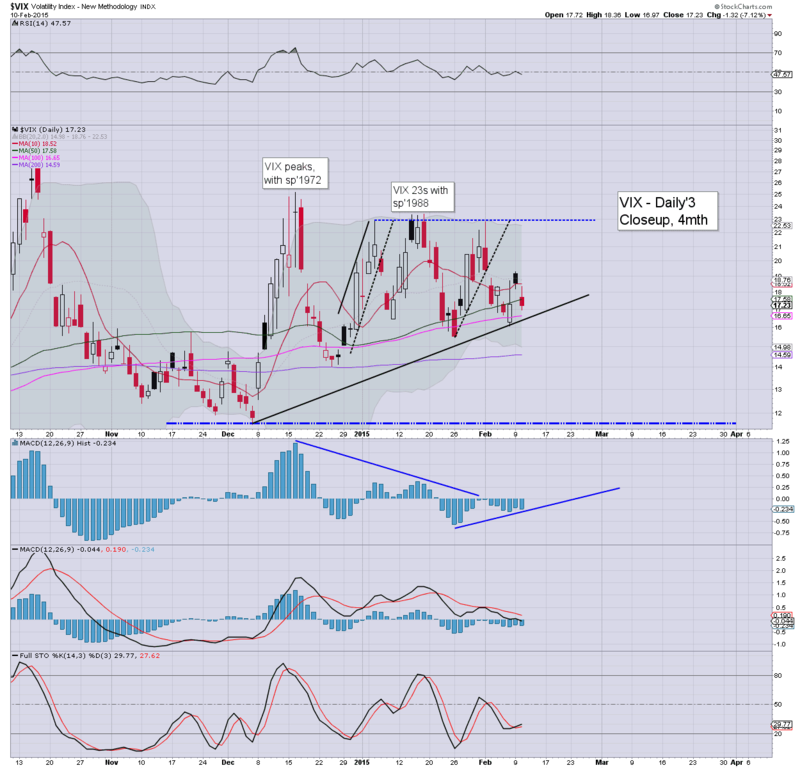 VIX has negated the earlier reversal, -4% in the mid 17s. Metals are cooling, Gold -$5. Oil is set to lose the $50 threshold, -3.8%, as the chatter continues about Citi's call for the $20s. Its getting a little tedious... as the market is swayed by periodic headlines about Greece. Best guess remains... sp'2025/20 zone... by tomorrow. *I'm bullish TSLA earnings (due Wed' close)... although I ain't planning to meddle in that one. 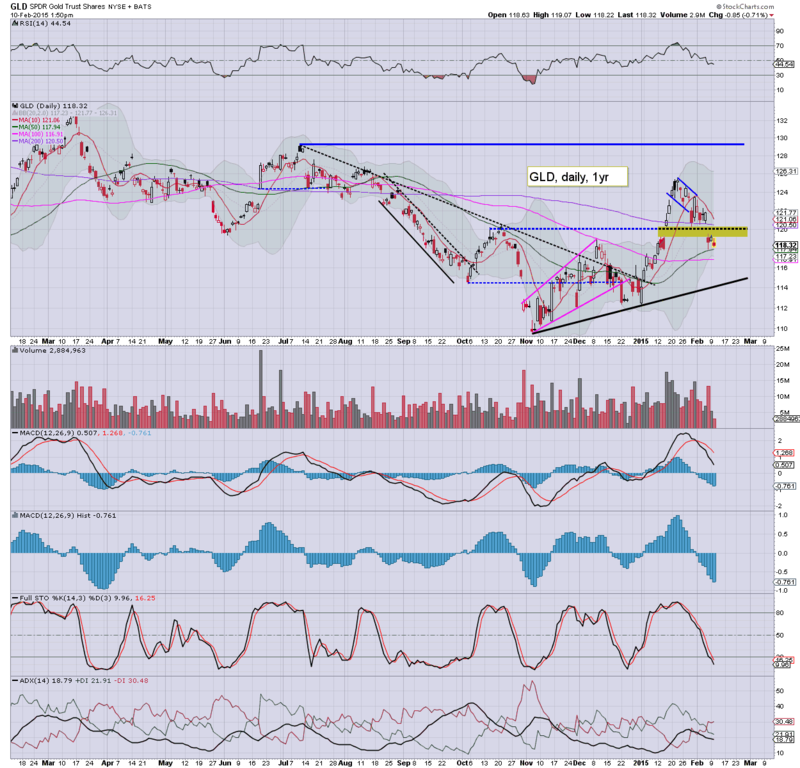 The $227/230 zone remains key resistance.. if that can be broken over.. then 250/60... rather fast. I noticed an update from Walker.. although it is over an hour long. For those who can't get enough chart chatter though... its pretty good. time for tea.... back at 2pm... when I am expecting this nonsense to be lower than it is now. *early lunch was good... I'm fuelled up for what could be a very entertaining afternoon. R2K is -0.4%... leading the way.. with the 'old leader' Trans.. set to follow. Oil -3.2% is not helping the market, and after Citi called for Oil $20s... for those trying to catch the falling knife of energy stocks.... the next few months could be especially tough. Indeed.. notable weakness. RIG -8%, after a downgrade by Credit Suisse. SDRL -5.5%.. in sympathy. 11.29am.. renewed strength... but seriously.. who the hell wants to buy the sp'2050s right now? Well yes... the BoJ... but who else? All things considered, the sp'2020s still look highly likely by tomorrow. It will only take a single headline on the news wires to smack this market into the 2020s.. which is very viable by end of today. 10.03am.... so... right now.. best case for the bears by end of today.. sp'2025/20.. with VIX 21... that'd certainly give the mainstream a bit of a jolt. 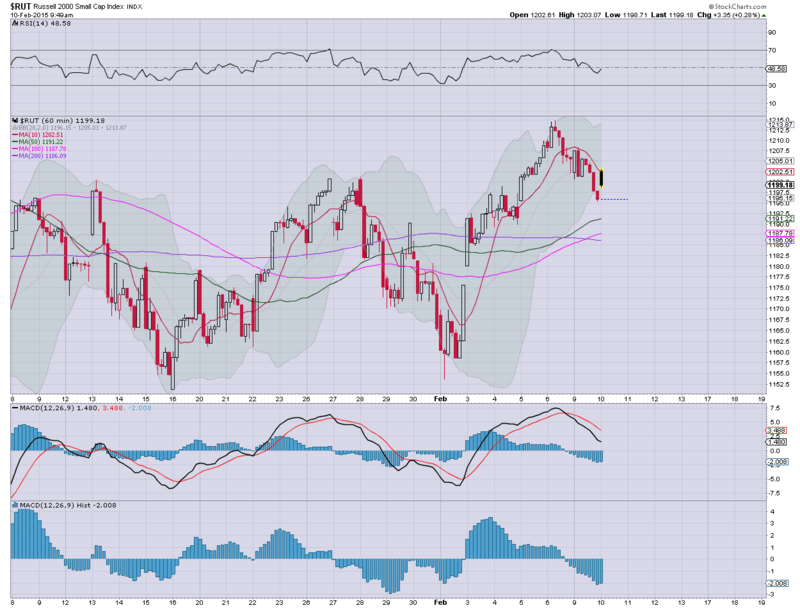 10.29am.. R2K -0.5%... and the bigger weekly chart is starting to look a little bit stinky. 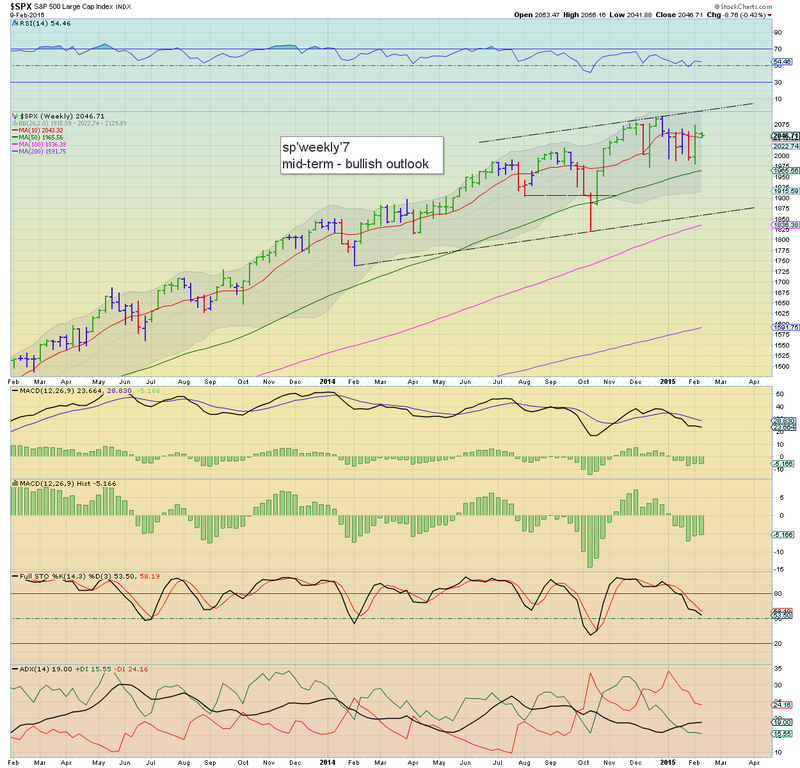 Keep in mind, the bearish monthly cross on the sp'500 from end January.. is STILL holding. Good morning. Futures are moderately higher, sp +13pts, we're set to open at 2059. Metals are weak, Gold -$6, with Silver -1.1%. Oil is somewhat weak, -0.9%, but holding above the big $50 threshold. So.. we're set for opening gains, although nothing too significant. However, I strongly expect the gains to reverse.. and fail today. After last weeks hyper gains, a retrace to the 2020s still looks HIGHLY probable before the bull maniacs have a chance at new highs. Traders should be mindful of an opening reversal. Eyes sharp for any black-fail candles on the index 15/60min cycle charts. *in far more important news though... Sony have decided to share the Spiderman to Disney... .so the Avengers will have another important Allie for the battle about against the mad titan Thanos. *I'm still struggling... so... updates still somewhat sporadic. In any case.... have a good Tuesday. 9.36am... opening black-fail on the R2K.... bulls... beware! 9.46am... the reversal candles are holding... its pretty important..... would be pretty amusing to see a complete fail of this opening nonsense. US equities closed weak, sp -8pts @ 2046. The two leaders - Trans/R2K, settled lower by -1.0% and -0.8% respectively. Market looks highly vulnerable to slipping to the sp'2020s in the immediate term. Highly recommended for those with an interest in the bigger picture. The only notable data is wholesale trade, and frankly, I don't think many will care. Mr Market will be far more concerned about Greece.